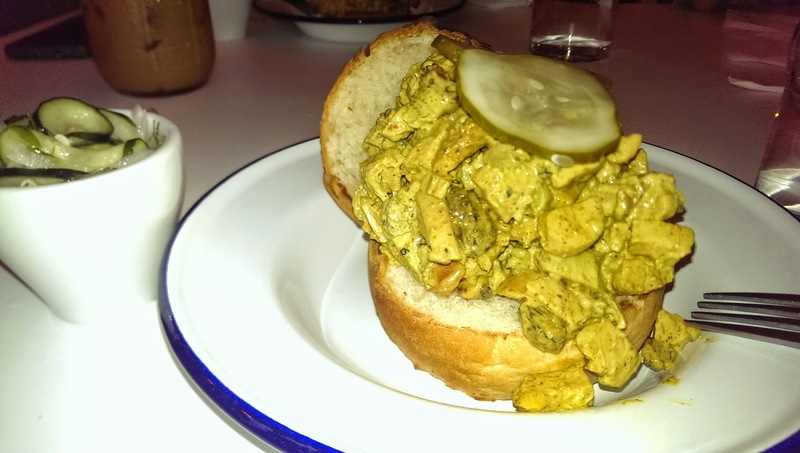 Foodies, this event is made with you in mind. 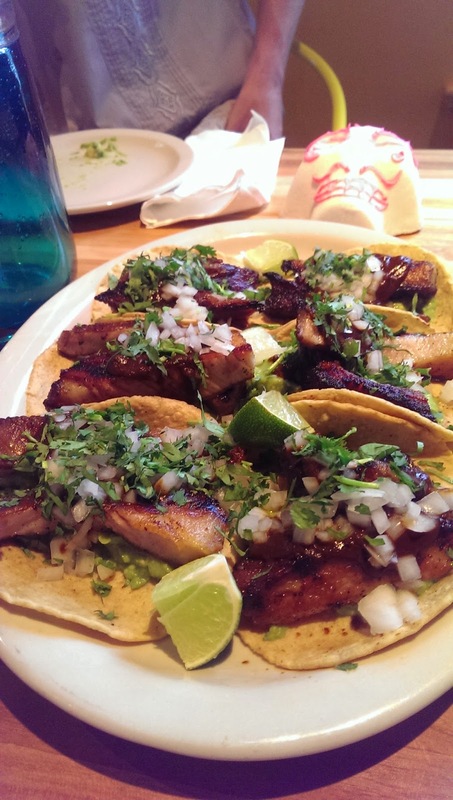 All you can eat and drink from Louisville’s most popular restaurants for $40/person. It sounds expensive, but considering the quality of the restaurants, the atmosphere of innovation, and the iconic locale (Churchill Downs Millionaire’s Row), you get a very good bang for your buck. What is it? Taste of Innovation is a reception/networking event for the IdeaFestival, a 4 day celebration that brings together innovators and leaders from around the world. Several presentations, films, and events are scheduled to share ideas and research that impact the arts, business, technology, design, science, philosophy and education. 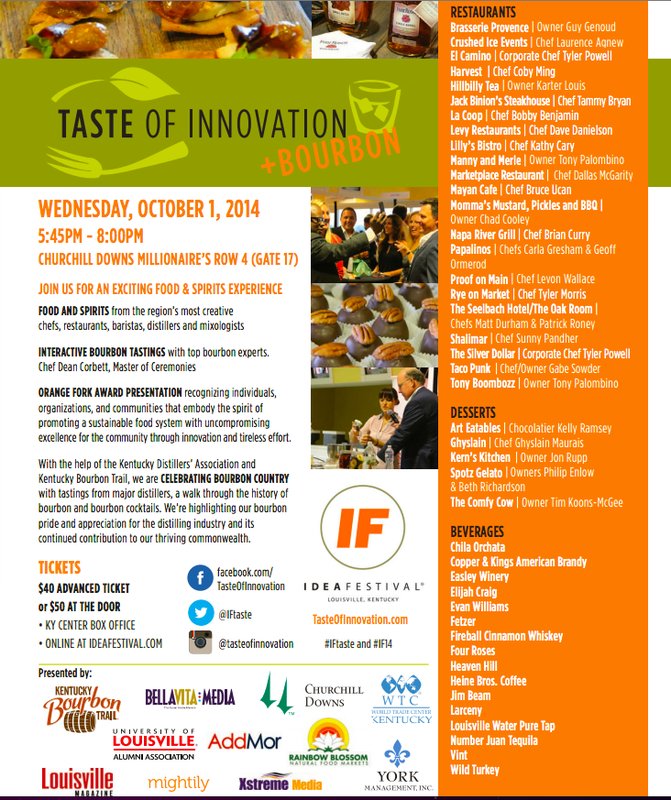 At Taste of Innovation, over 30 booths will be available with unlimited samples of food, desserts, coffee, specialty drinks and of course...Bourbon. Local favorites confirmed to be there are Lilly's Bistro, El Camino, Hrvest, Mayan Cafe, Rye on Market, the Silver Dollar, and many more. What dishes can we expect to see? How about croissant doughnut with Bourbon Maple glaze and caramelized bacon from Ghyslain, shrimp ceviche with bourbon soy sauce from the Mayan Cafe, black sapote hand pies with coconut cloud cream from Crushed Ice Events. Want more? What about chocolate dipped pork with a honey lavender Bourbon Glaze, cabbage Bleu d’Auvergne and potato gaufrette from French restaurant Brasserie Provence. And from my favorite restaurant, Lilly's Bistro, Marksbury Moroccan pulled lamb shoulder. This is my first year so I'm not sure what to expect, but I've heard great reviews from everyone. Time: 5:45 p.m. – 8 p.m. Cost: $40 in advance | $50 at the door. $6 convenience fee if you buy online or over the phone (1-800-775-7777). Go to the box office at 501 West Main to pick it up to save $6. Dress code: Dressy or casual is up to you! While people are discussing ideas on how to shape the world, I’ll be happy eating away inventive new dishes that are sure to enlighten my taste buds. See you there! This week was one of our most exhausting weeks yet. Our weekdays started early and ran late into the night, leaving very little time for sleep and home. So we resolved early on to have an easy weekend, but that somehow turned into another marathon of events. 9/26/2014 | 6 p.m. - 10:30 p.m.
You know it’s going to be good when there’s an anniversary celebration. Special for this Trolley Hop is a FAT Friday photo challenge that'll get you discounts to stores and a chance to win a prize. If you're not familiar with Trolley Hop, it's an event that allows people to hop on and hop off a free trolley to check out restaurants and shops on Frankfort Ave. Many local businesses will offer discounts and host free tasting, refreshments, and live music. Eyedia (1613 N. Mellwood Ave) is hosting a thank you party for councilwoman Tina Ward-Pugh, which will have free food, drinks and music. 9/27/2014 | 11 a.m. - 11 p.m. Boasted as Louisville's spiciest festival in the area, this festival will showcase Indian cultures, food, clothes, jewelry, henna tattoos and entertainment. We've never been and hoping to make it there to see the dances. Indian dances are one of our favorites, they’re full of energy and color. An advice from an insider, go later in the evening, after 5:30 when things will pick up. 700 & 800 Blocks of East Market St.
Head to NuLu this weekend for a street festival that includes food, beer, local vendors and music. Nu Lu, meaning New Louisville, is that part of East Market where sustainable green buildings are realized and where hip and trendy restaurants/art galleries bring in regular crowds of foodie and hipster. Your inner hipster will rejoice at micro-brewed beer and food trucks and your friends will enjoy the festive atmosphere (and making fun of hipsters). 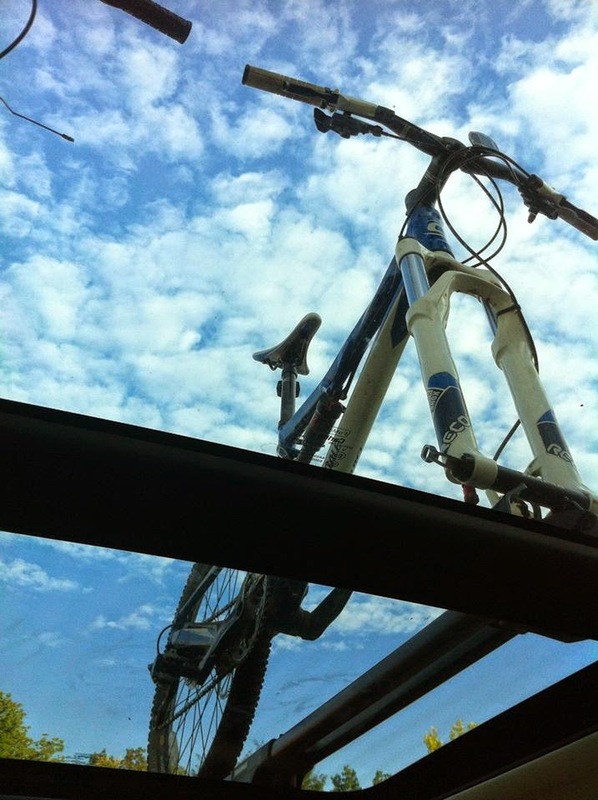 9/28/2014 | 9:30 a.m. - 4 p.m.
We’re packing our bikes and heading over to Starlight Indiana for a 40 mile ride in scenic back country roads. The event costs $35 (late registration), which includes breakfast, coffee, and lunch. A new event for us, we’re not really sure what to expect. Biking is a great way to see the beautiful fall scenes at a slower pace and the sunny cool weather will make for a nice day out. We had an ambitious day planned: morning meeting, Farm Tour, Bourbon Festival, volunteer, pho and study. It was a long day but I'm glad I did it. The Shelby County Good Neighbor Tour is officially one of my new favorite events! We started the day early at the Shelby County Farmer’s Market to pick up our passport, maps and list of participating farms. Unlike those in the city, the market is in an actually barn, reminding me of early morning markets in the Vietnamese country side. Everyone was extremely friendly and the goods a lot cheaper than those in Louisville. $.75 for pears! The visit was made more special when I found the pawpaw fruit, the largest native fruit in North America. 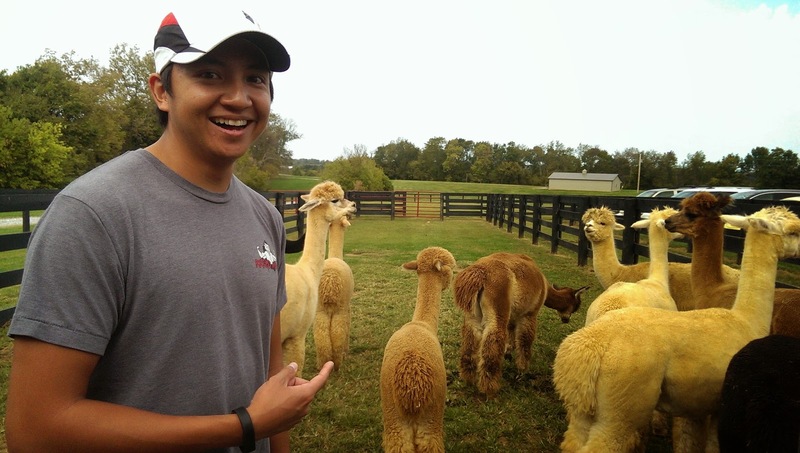 Our first visit took us to the Perfect Timing Alpacas farm where 12 friendly faces greeted us. Cute, cuddly and friendly, the alpacas entertained us just by being their cute selves. 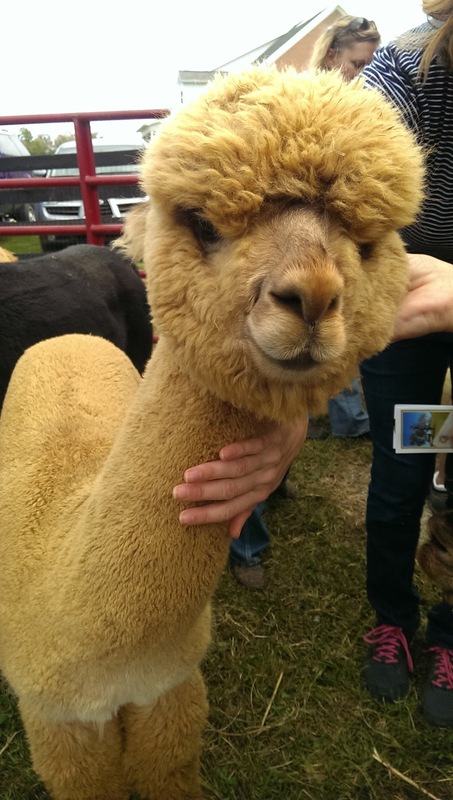 The family had a small display booth of all the alpaca products that were extremely soft. 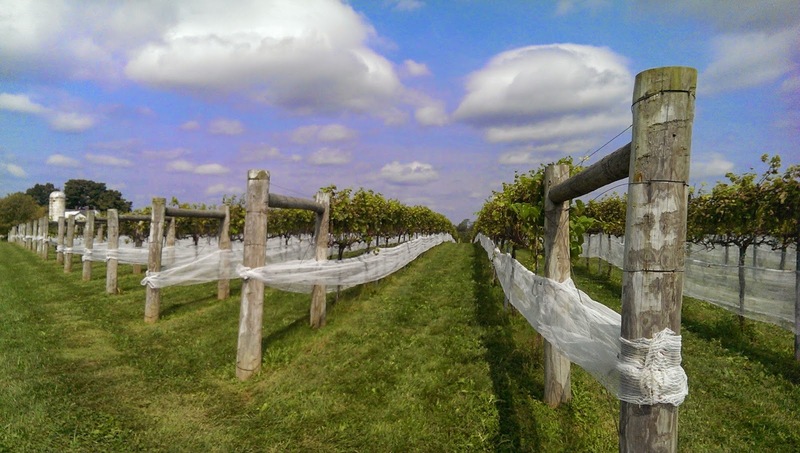 Not too far away was our next destination, Vegh-Davis Vineyard. We tasted wine and the owner gave us a personal tour of the vineyard. She shared stories about the grapes growing process, wine production and a wine tradition that started in Hungary. 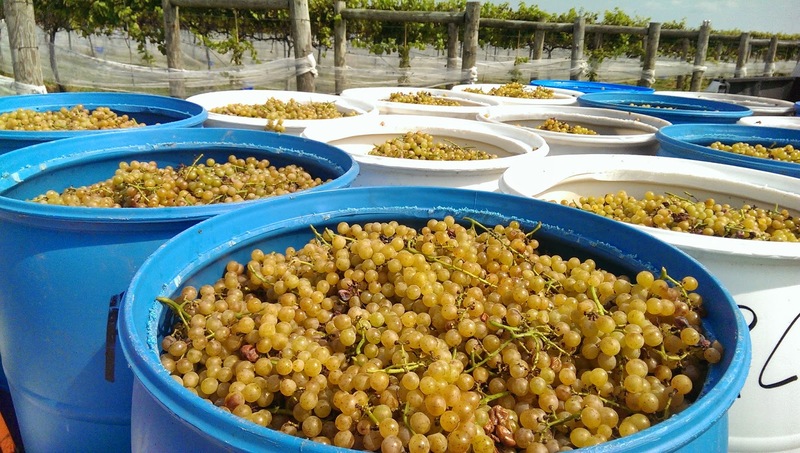 Lucky for us, the grape pickers were there for the harvest so we saw the process. 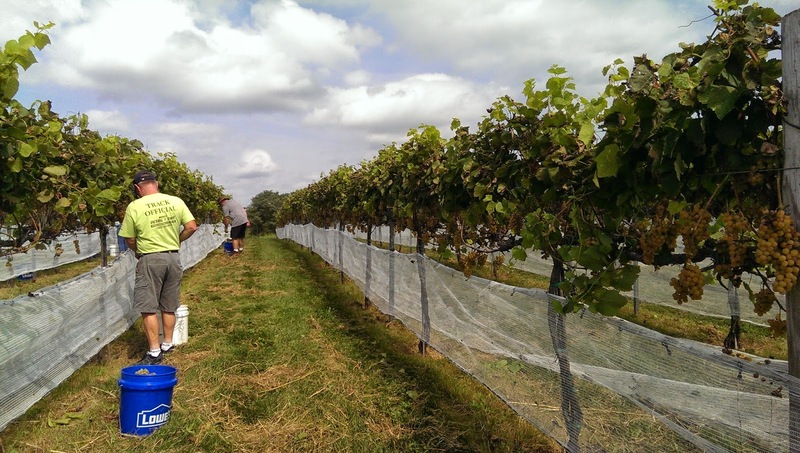 I signed up to be a grape picker next year, the pay ($5/hr) goes to a local charity. A bonus for my city boy husband, it was his first time seeing grapes on the vines. In a rush back, we had time for only one visit and decided that it was ice cream time. 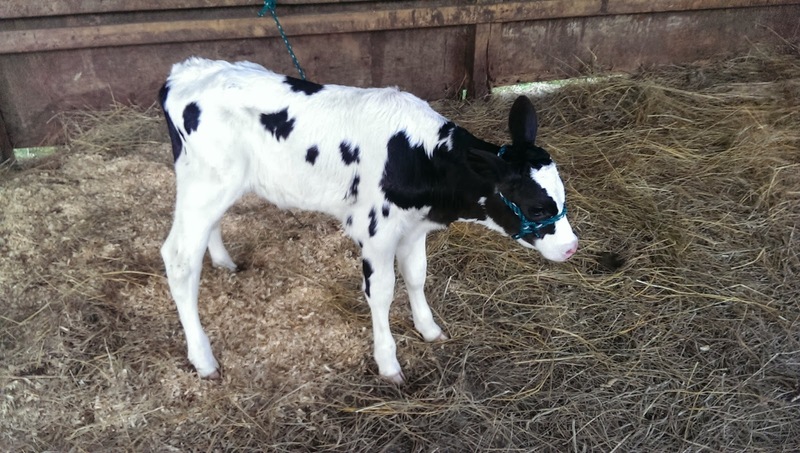 The Cherrywood Dairy Farm was a short distance down the road. 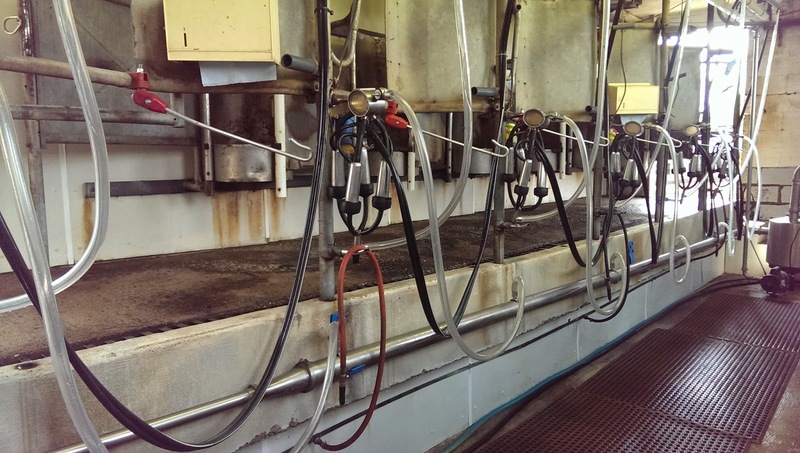 The milking facility smelled of cow manure, feeds circled by flies and cow manure had its own pit. Here we see that farming life is not all rustic charm, ice tea on the porch and mason jars, but hard dirty work. 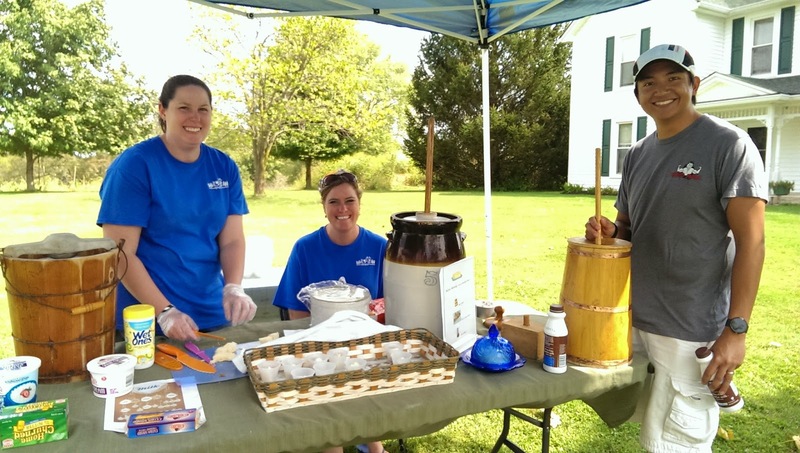 Hospitality of the owners was at full force, they treated us to milk, ice cream and freshly churned butter. We didn't make it to the Bourbon Festival but that meant we had a little more time connecting to small local farmers and learning about their lives. I was charmed by their hospitality, country twang and openess. We learned trivia things, like the silos keep the cow feeds, alpaca’s fur is hypoallergenic, that freshly churned butter is made with love and tastes like heaven. But what we took away from our visit is a better understanding of the hard work, pride and dedication that goes into small family farms. Since hearing about the pawpaw fruit on NPR three years ago, I've been a woman obsessed with finding this fruit in Louisville. 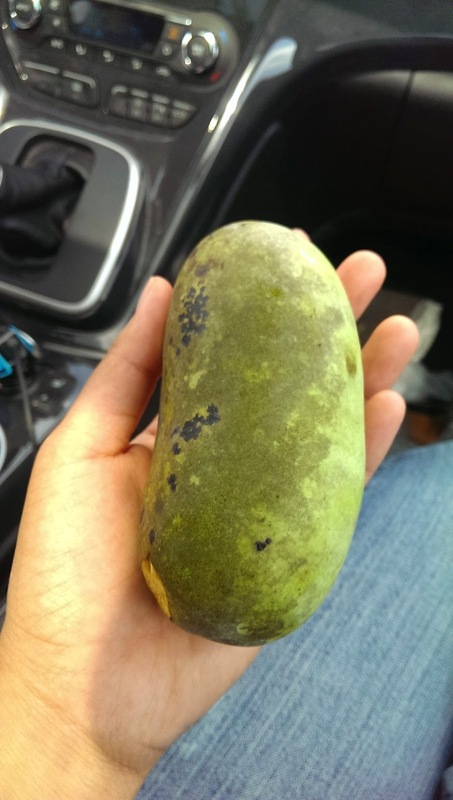 The largest edible fruit native to America, pawpaw flavor resembles a mix between mango, pineapple and banana. I'm a lover of tropical and exotic fruit and was immediately intrigue. I did extensive research into its history, habitat, taste, nutritional values and anything I can find. It's a problem I have, I take my food way too seriously. I found that they grow naturally in this region, so got into foraging briefly in hope of finding the fruits and trees. My adventure brought me no pawpaws, only a lot of jokes from my husband and friends. I heard that they ripe around August to October, so I took trips to local farmer's markets to find this mystery fruit. I had no luck. I asked an older co-worker about the fruit since it was historically enjoyed by many people in the region. She only gave me a song about pawpaw, "Where, oh where, oh where is Susie? | Way down yonder in the paw-paw patch....". I was tempted to take a trip to Kentucky State University after hearing about its pawpaw farm and reputation as the only full time pawpaw research facility in the world. I never made it there, I didn't think an Asian woman lurking in the orchards would be welcomed. It's so hard to find because the fruit never took off commercially. It has a short shelf life (2-3 days) and doesn't travel well because it bruises easily. Not the prettiest fruit, it has no appeal to the casual buyers. Historically enjoyed by Native Americans and early settlers (Thomas Jefferson and George Washington among the most famous), pawpaws slowly became a thing of the past as people drifted away from their agriculture roots. This weekend, while on the Shelby Good Neighbors Farm Tour with my husband, I saw a bright neon sign in the back corner of the Shelby County Farmer's Market, blinking two beautiful magical words "Paw Paw". After three years, I finally got my hands on the forgotten North American tropical fruit. 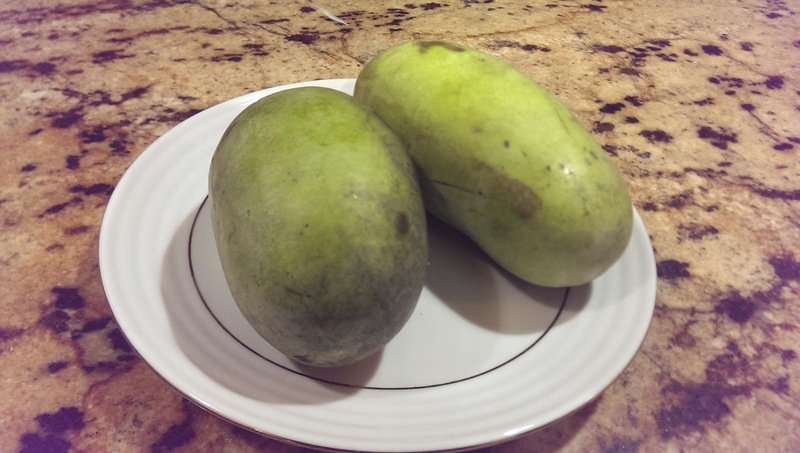 I found a kindred spirit in the elderly farmer, who enthusiastically shared with me the pawpaw's quirky traits, its cancer fighting potential, super fruit like nutritional values (high in protein, calcium, potassium, etc.) and its future. My obsession is renewed. I tasted its yellow custard like flesh for the first time and found myself mystified once more. It has a mild sweet flavor that brings vague reminder of several tropical fruits from childhood that I can't quiet place. A little bit of custard apple (mang cau ta, na), soursop (mang cau xiem), and annona (binh bat) all blended into a fruit that's uniquely its own. Several friends tasted it and agreed that it does have the mango, pineapple and banana taste. My pawpaw search finally came to a satisfying end. Intrigue? You can find your own pawpaws to taste by heading to the Shelby County Farmer's Market (1513 Midland Trail, Shelbyville, KY). It's open from 8 a.m. - 12 p.m. on Saturdays. Look for the gentleman with the bubble wands at the very end of the market, he has plenty to sell. They're in season from August to October and are going for $2/lb. They're ready to eat when soft and fragrance. If you can't find it there, maybe we can give that foraging thing another go? *Kentucky State University is doing some interesting research with pawpaws and has the best information. Fall already made its way to Kentucky, bringing with it cool evenings and patchy morning fog that shrouds the hills in mystery. One of my favorite seasons, Fall in the Bluegrass State is an explosion of colors; bright yellow, orange, red and green paint the trees in a sea of colors. The cool temperature is a jumpstart to the body, waking up your senses, turned languid by summer heat and humidity. 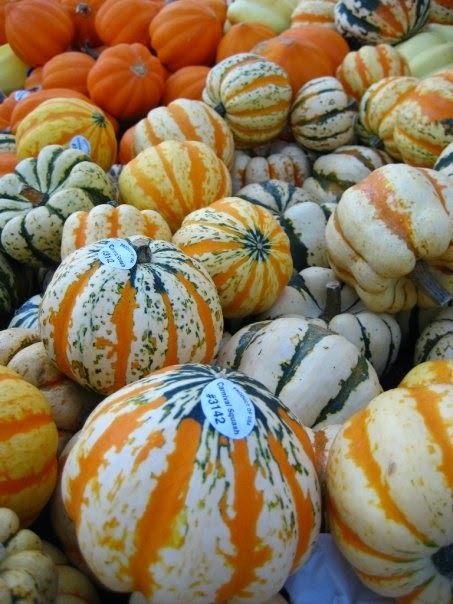 For me, Fall means lively festivals, pumpkin spiced everything, and an obligatory visit to the farm for the harvesting of apples and pumpkins. This Saturday (9/20/2014), I'll skip Huber's Farm and head instead to 12 local farms in Shelby County for their Shelby Good Neighbors Farm Tour. 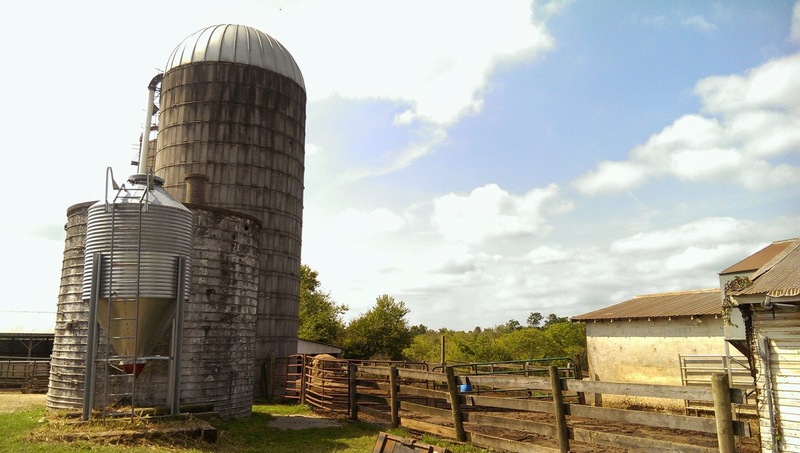 From 9 a.m. - 4 p.m., these local farms will open their doors to the public so we can experience first hand the day to day life of small farms. 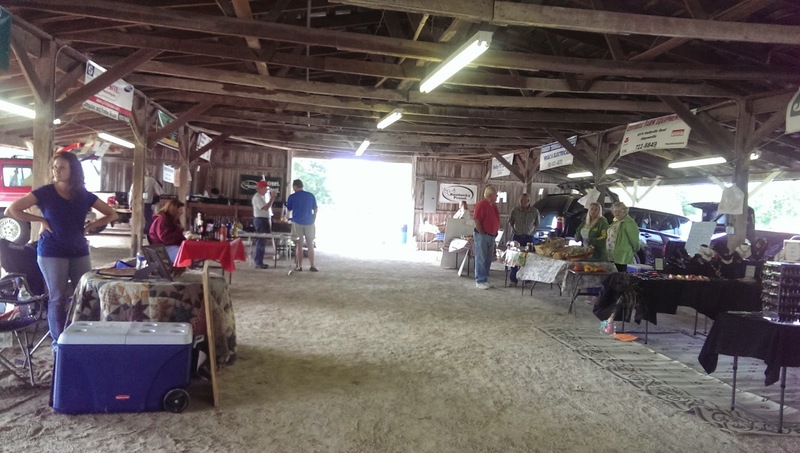 It's a great opportunity to experience the county, taste the food, and connect to our farmers. Start at the Metzger's Country Store or Shelby County Farmer's Market (8 a.m. - noon) and pick up a map of participating farms. Take a self guided tour to as many of those as you like, get stamps on your Passport and enter for a chance to win a grand prize filled with local goods. I'm looking forward to seeing the alpacas, harvesting honey, tasting homemade ice cream, and making wine. Gaslight Festival (9/14 - 9/21) | 10434 Watterson Trail, 40299 | all day: Located in J-town, the festival is the 5th largest festival in the region, hosting 200,000+ visitors every year. A celebration of the city and its business, the festival will have 150+ arts and craft vendors, delicious and unhealthy fair food, a balloon glow, a car show, parade, games and activities for kids. There's no shortage of fun things to see and do, but be warned, it's crowded! Bring comfortable shoes, you'll be walking and standing a lot. 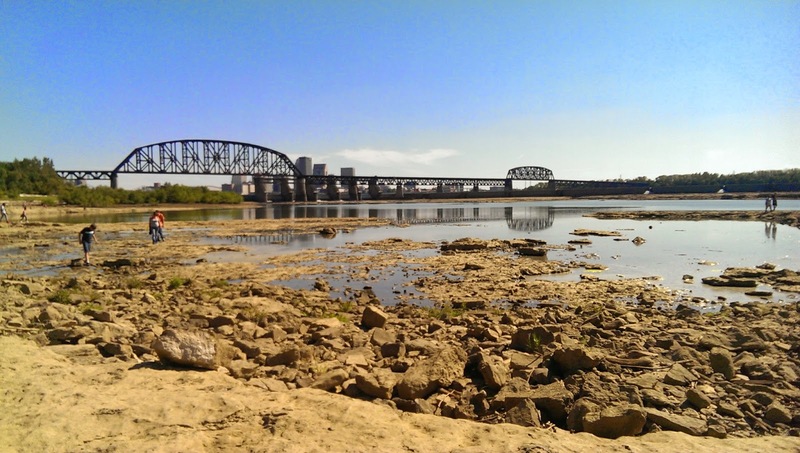 Hike and Canoe the Fossil Beds (9/20/2014 & 10/11) | 201 West Riverside Dr., Clarksville, IN | 9:30 a.m. - 1 p.m.: Head to the Falls of the Ohio Interpretive Center for a free canoe and hike tour of the fossil beds. You'll kayak/canoe on falls and hike the fossil beds with your own free tour guide. If you don't have a canoe, you can rent one. If water is not not your thing then opt for the 3 1/2 hour hike of the fossil beds with an expert (9/20, 9/27, 10/4, 10/11) at 9 a.m. The Army Corps of Engineer lowered the water this month so a very large part of the fossil beds is exposed. 200 Years on the River: (9/20 - 9/21) | 7410 Moorman Road, 40272 | 10 a.m. - 5 p.m.: Another family friendly event for lovers of history, especially for those interested in 19th Century life around the Ohio River. You'll delight in the ladies dressed in pretty attires and gentlemen/officers in pretty manners. You'll meet Abraham Lincoln spinning tails, a black smith demonstrating his trade, and young kids going about their daily chores. You can also tour the old house and gardens and interact with the volunteers while in characters. The kids will love digging and pretending to be archeologist. On Sunday, there's an 1860s baseball game. $6/adult, $5/seniors, $3 kids. Special rates for family. 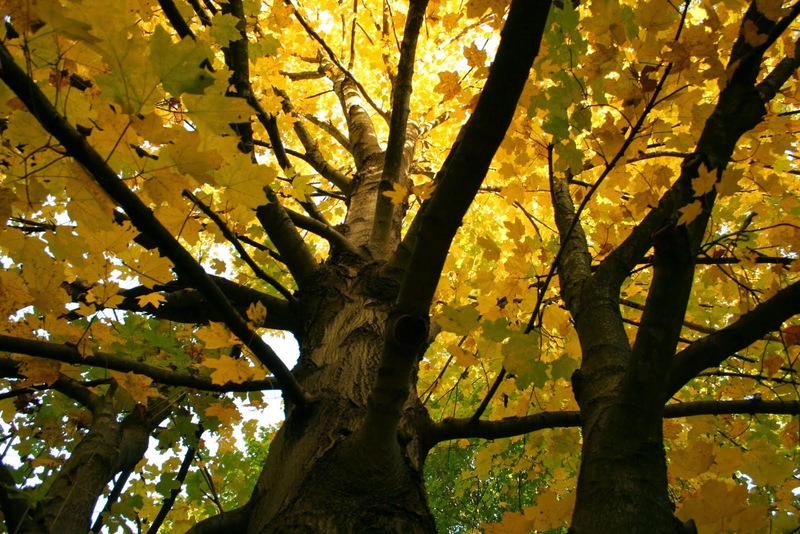 Other Fall Festivals: Check out this list of over 60 fall festivals going on in the area this season. There are over 2,500 restaurants in Louisville and if you're on a mission to eat through that list (like me), there's no better time to start than this week. From September 8 - 19, 15 local restaurants are offering 2 course meals with a drink for only $10 or $15, depending on the restaurant. There are some very expensive restaurants on the list, so take advantage of this opportunity to try something new without breaking your wallet. 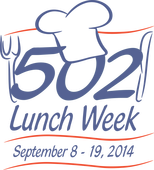 The menu for 502 Lunch Week at these restaurants is smaller than their regular selection, but you're still getting a great deal. Trust me, I did a little price comparison :) You'll see me at Louise Le Francais and Brasserie Provene this week trying out some French fare. I usually write about events after I've experienced it but I want to share this before it's over! I've done my homework for you. Here's a list of the participating restaurants, cost, ratings (on Yelp) and offerings to help you decide where to go. Happy eating! My recommendations? Brasserie and Provence if you've never had french food (they also have great ratings). For a swanky atmosphere, St. Charles Exchange reminds one of a speakeasy, Gatsby (Seelbach) and Sway (Hyatt Regency) are part of very nice hotels. I also heard Wild Rita's and Down One Bourbon are very good! Bonus: If you end up liking Louise Le Francais, there is a Groupon going on now, you pay $29 for a $50 Groupon to spend on dinner. A tradition thousands of years old is coming to Louisville for the first time! 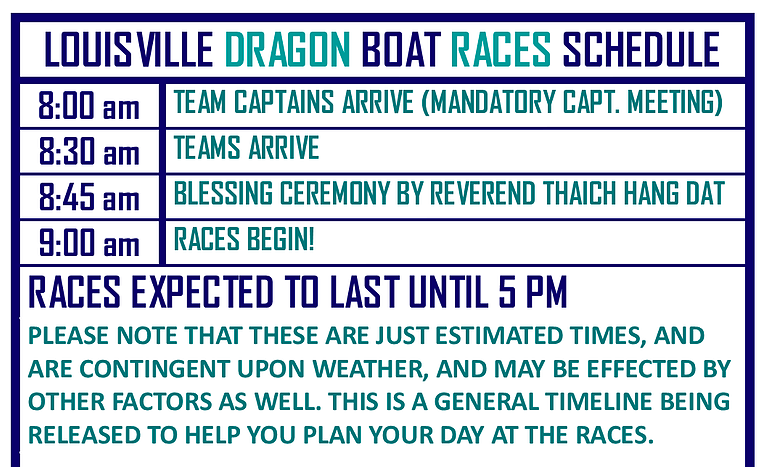 Dragon Boat Racing is a popular annual event in many Asian countries, bringing together villages in a festive environment of competition and celebration. 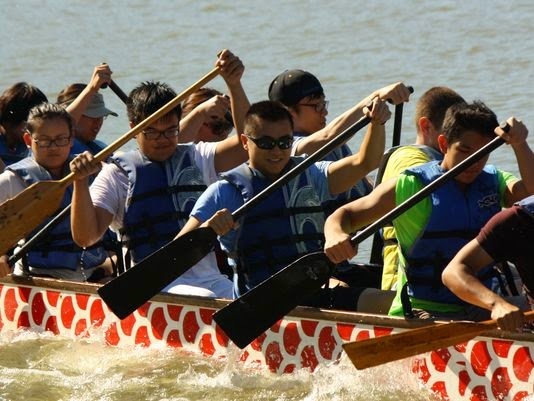 More than 20 teams, consisting of community groups, non-profits, and individuals, will be competing against each other on the scenic Ohio River this weekend. Each team consists of 20 rowers, 1 steerer and 1 drummer. You can expect to see a lot of team spirit and unique costumes. Some of the teams are using this opportunity to raise funds for their non-profits. 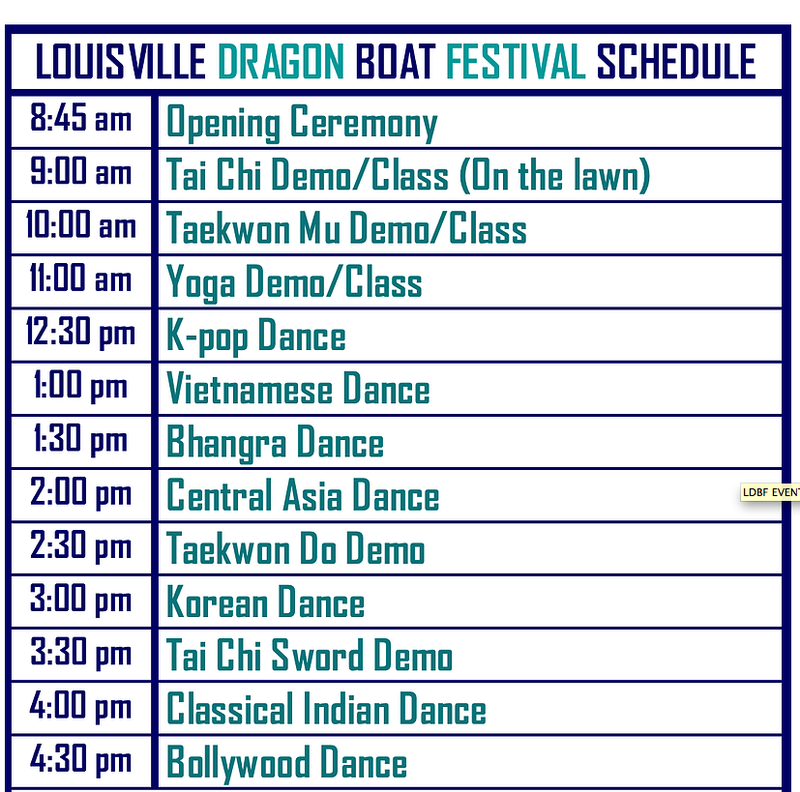 Co-sponsored by Crane House Asian Institute and Third Century, the Louisville Dragon Boat Festival is also a celebration of Asian Cultures. The daylong celebration will be filled with cultural activities, arts and crafts, music, food vendors, and dancing. Check below for a lis of events and activities. Races will be going on all day. Henna (India), rangoli (ruchi), pottery, origami, Chinese opera mask, fabric design, lantern, good luck satchels, hackie sack (Korean and Chinese), calligraphy (Korean and Chinese), Mochisuki, traditional games, ping pong, Chinese painting, Chinese tea ceremony, Chinese jo-jo, etc. Location: Waterfront Park – Joe’s Crab Shack – 131 River Road (if you’re facing the river, the event will be to the right of Joe’s). Parking: 1st and Witherspoon Garage, meter parking on the streets. Or if you want free parking, park along River Road and the Park’s parking lots (you’ll just have to walk a little further, maybe bring a bike). It'll be a beautiful cool and bright day on Saturday, so come and experience a little bit of Asia right in your own back yard.